Is This the Dawn of the ‘Sten’ Party Era? National Bridesmaids Day falls on 25th March. Here at Butlers in the Buff we work closely with bridesmaids to provide gorgeous, charming, and barely-dressed butlers to entertain the bride and her female friends at one of the most crucial events of the wedding season, the hen party. In fact, over the years we have come to appreciate the hard work that bridesmaids put into the whole shebang so much that in 2015 our company, Butlers in the Buff, founded a national day and then joined forces with Hen Heaven to celebrate these amazing women. From then on, the 25th March has been recognised as National Bridesmaids Day to give thanks to those who go above and beyond to ensure the big day is as special as possible. Throughout the years, we have consistently been the original and the number one choice for bridesmaids to make their hen parties one of a kind. Since we began in 2001, our butlers have often been the only men privy to the inner goings-on of the sacred hen do. However, a new survey conducted by Hen Heaven suggests that this may no longer be the case. According to Hen Heaven’s research, not only are 76% of women leaning towards allowing male friends or family members to be in their bridal party as ‘bridesmen’ or the ‘man of honour’, but also 73% of women said they would consider inviting male friends to their hen do. These statistics are referring to a new type of phenomenon which has really taken off within the wedding industry, the ‘sten’ do. 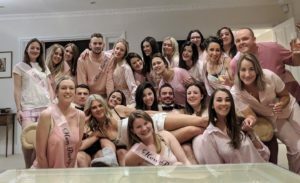 The choice to combine stag and hen parties to create the ‘sten do’ has become very popular in the last few years because nowadays couples tend to share and mix friendship groups. Those who consider throwing a ‘sten’ party feel the gender of their guests is irrelevant and that it is a more inclusive option for everyone. Also it saves time, money, and effort when it comes to planning the event because you get two for the price of one. Separate hen and stag do’s are still the top choice, however enquiries regarding ‘sten’ parties have increased by 60% in 2018 alone and many stag and hen companies are predicting that this number will only increase in the future. Of course, to ‘sten’ or not to ‘sten’ all comes down to personal preference and there is nothing wrong with wanting individual stag and hen nights to celebrate without your partner, but combining the two is certainly something worth thinking about. Regardless of who is on the guest-list it is safe to say that Butlers in the Buff are still the best choice for all pre-wedding celebrations, don’t you agree? In celebration of National Bridesmaids Day 2019, here at Butlers in the Buff we are going to give one lucky bridesmaid, or bridesman, the chance to win a BUTLER IN THE BUFF for FREE. Check out our Instagram to enter. Winners announced on National Bridesmaids Day so check out our social media pages for all details on how to enter and when the winner will be announced. Hen Heaven is also offering up to 55% off on selected hen houses when you book a last-minute hen do! The competition will run from Monday 25th March until Friday 29th March at 5pm, discount is dependent on location and departure date, please see full terms and conditions. For more information, go to the Hen Heaven website at https://www.henheaven.co.uk/special-offers.